And that is that! Thanks for following along on the adventures of Axe Cop versus the Songster. It was fun to revisit Axe Cop with Malachai a bit older and partnering with Parry Gripp was a privilege. We are going to come up with a cool package to sell this story and music as one item for those interested, I’ll post it on the blog here when it comes out. Thanks again to Parry for all his tunes. This was a lot of fun. I won’t be posting new Axe Cop material for a while. Come see me over at Bearmageddon.com and keep tabs on me on Patreon, Twitter and Facebook to find out when other projects are being released. 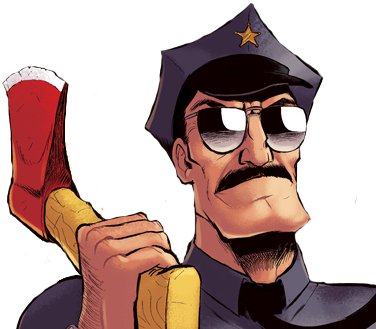 I’m so excited to be merging the motion comics voice of Axe Cop, Dave DeAndrea, into this project. Click the track to hear Dave rock the vocals on Axe Cop’s song Foxes the Size of Couches. Want to see the next four pages and a bunch of animation I did a while back (and that’s just what I released today! ), check out my Patreon starting at only $2/month. Also, check out my store. Many of the items on it are exclusive to my store and come directly from me. Use the code HIGH FIVE to ger 5% off. Or IMNEWHERE if you have never shopped at my store before for a one-time discount of 17%. We have some exciting plans for this comic. It’s already got songs. What if I said video game? That’s all I’ll say for now. Just wait, this is Axe Cop’s first musical. We’ve teamed up with Parry Gripp to make this comic reading experience audible as well. Every time a page with a song is posted, there will be a new Parry Gripp song posted with it. It won’t be on every page, but it should average out to every 2-3 pages. Tonight at 7pm (pacific time) Parry and I will be on Facebook Live to talk about this comic, answer questions, preview a song and generally chat it up. I will also be drawing one person as an Axe Cop style hero or villain. We always have a lot of fun on our live broadcasts (usually Thursdays at 5pm but this week 7pm). Also, Ask Axe Cop starts on Monday. 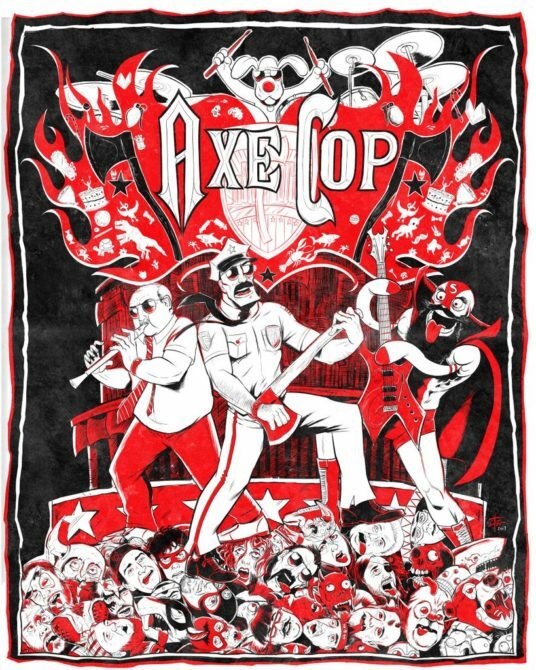 If you are one of my Patreon members you have already read both, since all Axe Cop material posts to Patreon one week early for $5/month and up members. Join today and you can read the next page of this story right now. Want a signed and numbered limited edition screen print? Want a coupon code for 25% off? Here you go! coupon code: SONGSTERRIFIC. This sale lasts only until the next page posts (one week)! If you happen to be coming out of the woodwork, having caught wind that a new Axe Cop story is happening, consider checking out Bearmageddon, my other webcomic, and some of my recent blogs about the creative life over on EthanNicolle.com.